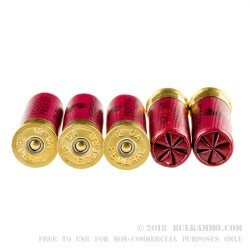 Federal Law Enforcement shotshells are designed to provide police officers with a reliable shotgun load to defend themselves against violent criminals. They serve much the same purpose for private individuals and hunters, all made possible by the innovative FLITECONTROL wad, which shapes the 9-pellet grouping and tightens it at medium range for superior versatility. The wad and the mass of copper-plated pellets leave the muzzle of the shotgun at 1,145 feet per second, staying together for about 10 feet before gradually disintegrating and spreading out. The design seeks to maximize impact on the target while minimizing missed shots and collateral damage. Each box contains 5 shells with solid brass heads. 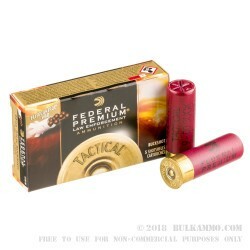 Federal Premium Ammunition is a highly regarded supplier of self-defense, hunting, and range ammunition to law enforcement, military, and private customers. The company operates a large production facility in Anoka, Minnesota in addition to running the US military plant at Lake City in Missouri. Federal belongs to Alliant Techsystems, a conglomerate of sporting and defense related companies. Shot 8 different/varying rounds through the Mossberg 930 Blackwater tactical shotgun at 20 yards. Q: How is the recoil on this ammo? Is it comparable to full power or reduced recoil slugs? 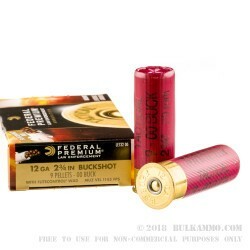 A: Hello Mitch, These 2 3/4" 00buck shells by Federal in 12ga. have significantly less felt recoil than a full power slug shell, and noticeably less than a reduced recoil slug shell. 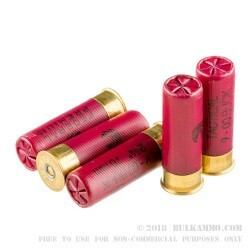 These are excellent target and defense rounds in 12ga. with good patterning. Q: What makes federal's flight control wad different from other wads? A: The FliteControl wad is designed to provide a tighter pattern, which allows the shooter to successfully engage targets with 00 buck at longer distances than other types of wads will allow.